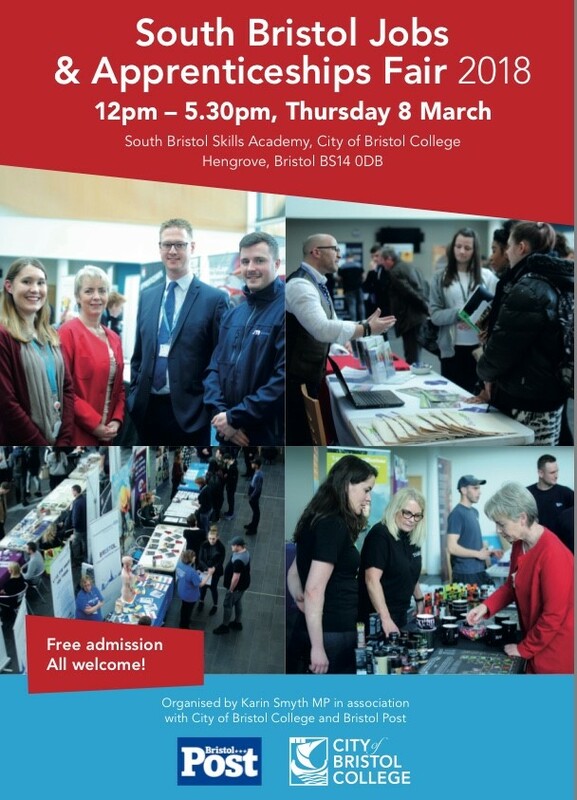 Following on from the success of last year’s event, Bristol South MP Karin Smyth has joined forces with City of Bristol College for another apprenticeships and jobs fair. Taking place from 12 noon – 5.30pm on Thursday 8 March, the event will involve local businesses and organisations with job and apprenticeship opportunities. Hundreds of young job seekers from across south Bristol and beyond are expected to attend the fair, which takes place at the South Bristol Skills Academy in Hengrove. It will feature a wide range of employers from a number of industries – including Kier Construction, Bristol Airport, Greene King, Marriott Hotels and Bristol Water among others. Not only will young people be able to talk to potential employers about the opportunities available, but businesses will be able to find out more about how apprenticeships could benefit them. Apprenticeships are available to people aged 16 or older with a minimum of 5 GCSEs and combine paid work with training and typically last between one and five years. They offer a minimum apprenticeship wage of £3.70 an hour to those under the age of 20 and National Minimum Wage for older apprentices (between £5.90 and £7.83 depending on age). The 2017 fair was the first of its kind with around 30 exhibitors and over 400 young people, many of whom went on to undertake apprenticeships. Lee Probert, Principal and Chief Executive for City of Bristol College, added: “We’ve seen many students benefit from apprenticeships, and we’re keen to support more young people in finding the right apprenticeship for them. Working with employers, we actively continue developing our apprenticeship offer to grow young talent in order to address local skills shortages. The Bristol South Jobs & Apprenticeships Fair is once again being run in association with official media partners the Bristol Post. It coincides with International Women’s Day and there will be information on apprenticeships for young women. The fair is free to attend with a limited number of free stands on offer for local businesses. © 2017 - Karin Smyth MP.